Anvillea garcinii is a medicinal plant traditionally used for the treatment of dysentery, gastrointestinal troubles, hepatitis, lung disease, colds, digestive problems and pulmonary affections and in liver diseases. Four new sesquiterpene lactones, garcinamines A–D, along with seven known compounds, were isolated from the leaves of A. garcinii. This is the first report of the isolation of amino acid analogues of parthenolide-type sesquiterpene lactones from the family Asteraceae. Total ethanol extract of leaves as well as the chloroform and n-butanol fractions were tested for their hepatoprotective effect using the carbon tetrachloride liver toxicity model. 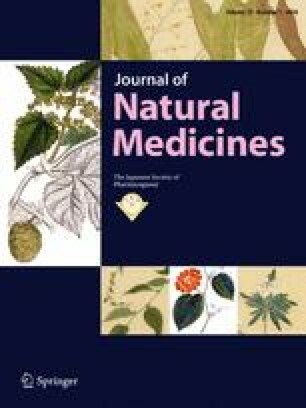 The chloroform fraction, at a dose of 400 mg/kg, demonstrated a significant hepatoprotective effect comparable to silymarin in all serum and tissue parameters. The cytotoxicity of all extracts and compounds were evaluated against five human cancer cell lines: MCF-7, HCT-116, HepG2, Hela and A-549. The results indicated that the chloroform and n-butanol fractions and compounds 3, 4, 7 and 8 displayed significant cytotoxic activity against these cell lines. The online version of this article (doi: 10.1007/s11418-017-1118-1) contains supplementary material, which is available to authorized users. This research project was supported by a grant from the “Research Center of the Female Scientific and Medical Colleges”, Deanship of Scientific Research, King Saud University.